On virtually every television show nowadays, the head writer and producer are the same person. This makes a lot of sense because it gives the show a unified heading and has been true of the modern series of Doctor Who with Russell T. Davies, Stephen Moffatt and Chris Chibnall in the future. But this wasn't how the show worked in the era spanning between 1963-89. Instead, the job was divided between two people. The producer was the big boss, the one who oversaw all elements of the production and had the final say, while the script editor/head writer was only in charge of the scripts coming in. And its true to say that those stories written by the script editor are those that capture the spirit of the show perfectly. After all, they should know the series inside and out. That is very true of the modern series as both Davies and Moffatt have handled the series finales and important episodes themselves. And in the original series, Robert Holmes wrote The Deadly Assassin and Douglas Adams, City of Death, arguably two of the best stories the original series ever created. 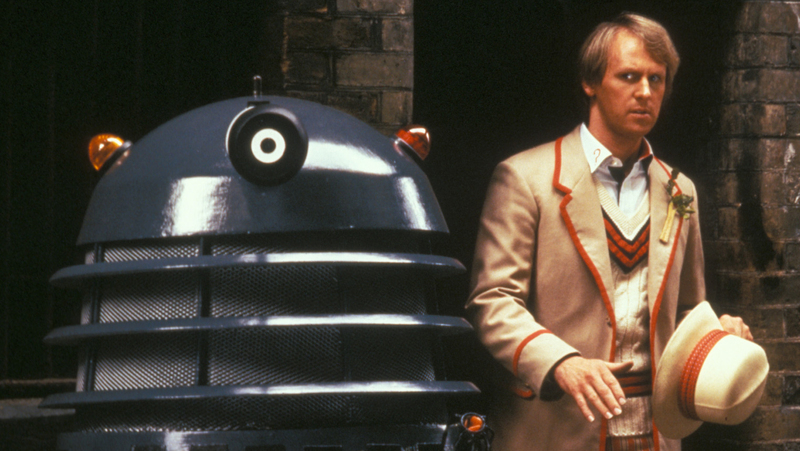 Then there is Resurrection of the Daleks, another script written by Eric Saward, the script editor on the show at the time, designed to hold down the middle of Peter Davison's final year as the Fifth Doctor. The story perfectly captures the aim of Saward and producer, John Nathan-Turner's view of the series in the mid eighties. It has a dark and gritty atmosphere an attempt at complex writing, the enjoyable choice to forgo the Doctor as the powerful protaganist and have him as the weaker, failable hero. But what is also clear from Resurrection of the Daleks is how many times Saward and Turner screwed those elements up and how they often failed to create anything beyond a cheap spectacle. When they used the terms, 'dark and gritty', they often meant that the characters were unpleasant, 'complex writing' meant that they used too many characters in a plot that didn't know what to do with them. And the weaker hero was often worse than uninteresting and finally, their idea of embracing the show's history mearly meant re-creating the iconic moments that the show had already done without any understanding as to why they were brilliant in the first place. That might seem like a really harsh assessment but I do hold Resurrection of the Daleks in higher regard than the writer does. Saward once called it the worst Doctor Who story ever written. Now, too me, this isn't the worst story from that series, considering that this story shared that year with Warriors of the Deep and The Twin Dilemma, two stories that did some real damage to the respect of the show afterwards. The flaws in this story aren't so fatal, making it a lot easier to watch. 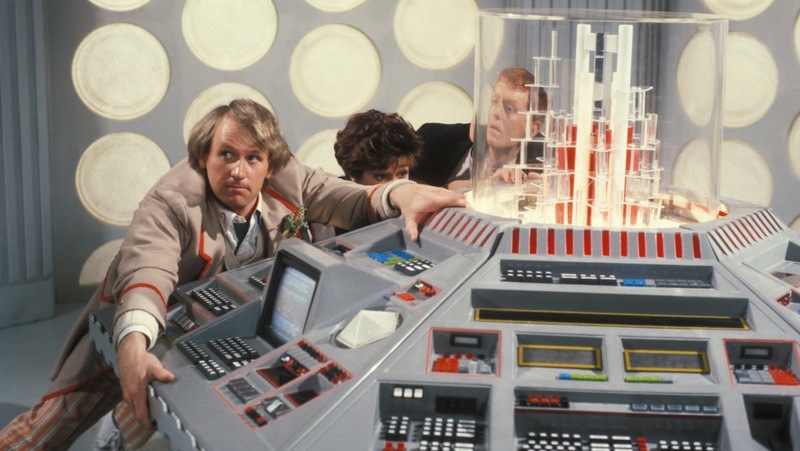 At its core, Resurrection of the Daleks is just trying to recapture the success of Saward's story, Earthshock, which saw the Cybermen return to the series after several years away. It works as a direct sequel to Destiny of the Daleks and had the plot just concentrated on that, it might have just worked. The war between the Daleks and the Movellans is over and shockingly, the Daleks lost thanks to a virus they had no protection against. They have no choice but to go back and find their mad creator, Davros, from the space prison he was sent too in Destiny. Once he is awakened, he agrees to find a cure to the virus but he secretly begins to plan his integration as the Daleks supreme leader. The Daleks secretly hate him and plan to toss him aside once he has served his purpose, a Dalek Civil War is brewing. So far, this story sounds good. Throw in a Doctor and task him with the job of protecting the innocents caught in the crossfire, this could have been a hell-of-a-story. One thing I like about Resurrection, is how it tackles the inherent conflict between the Daleks and their creator that Destiny missed. It propels the Daleks back into being a real threat and playing a real part of the narrative, rather than just being robots happy to be extensions of Davros's will. Saward manages to get them right, their brash, hostile and aggresive as well as sneaky, cunning, conniving and willing to back-stab their allies when the fancy takes them. While they might look like robots on the outside, they aren't robots on the inside. No other appearence for the Daleks does such a good job as getting to the true heart of the horrid little blobs, than this one, showing us why they are and always will be the Doctor's greatest enemy. But far too much other junk gets in the way, the Daleks have three or four plots going on at once, non of which are related to each other. Trying to find a cure for a virus threatening to wipe your entire species out should be enough for most people, but they are also trying to conquer Earth by placing clones had levels of power and they also try to turn the Doctor into an assassin by creating a clone of him programmed to kill everyone on the High Council on Gallifrey. While those are good enough goals to warrant a story of their own, all together on the screen at once, they don't get enough time to develop into something compelling. The third goal seems like a wasted opportunity, it would have been really fun to see a bad version of Peter Davison's Doctor roaming about Gallifrey but that idea is dropped almost as immedidately as it is introduced. And then we have the Daleks time corridor between 1984 and the future. What do they really need this for? If their primary goal is to rescue Davros then he is already in the future where they are. Instead, this is just used a checklist of things the Daleks can do and is a constant reminder of the continuity facination they had in the eighties. The Daleks had time travelled in The Chase and Day of the Daleks and so they do here, they mind-controlled humans in The Daleks' Invasion of Earth, so they do it here too. Resurrection spends so much time stealing from the past, it forgets to create something of a choerant story itself. But it isn't really satisfied ripping off past Dalek stories either as the cowardly Stien seems very reminisant of Fewsham in The Seeds of Death. If there weren't already enough Dalek plots on the go, there is also a number of other plots that go absolutely nowhere. A couple of people full down proving that humans are just as suseptable to the Dalek virus as the Daleks are, nothing else happens with that story. Tegan and Turlough spend most of the story alone and seperated with nothing happening to either of them to progress the plot. A lot of their scenes seem there just to eat up time, like when Turlough decides to use the time corridor to return to 1984, gets halfway there and then changes his mind. Tegan spends a whole scene trying to make a cylinder look like someone sleeping under a blanket, only to then give up on it before her captors even get there. 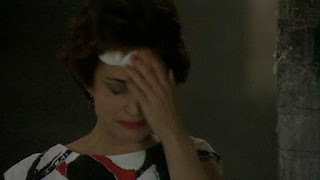 Guest star, Rula Lenska has no interations with the Doctor and dies in a seriously stretched out series of events where she tries to get the stations self-destruct mechanisms to work. Alright, that sets up the fact that Stien later does it but you could have taken Lenska out of the story and it would have changed nothing. And while Davros quickly and quietly puts together his army of hypnotised Daleks and humans together does do some plot advancement, it mires down scene after scene when all he does is convert new soliders. His number of soliders increases but he never does anything with them. One almost feels like Saward had no idea where he wanted the story to go, or how he would prod events in the right direction even if he did. It is telling that Davros plans to take over the Daleks but never has a scene with the Dalek Supreme. 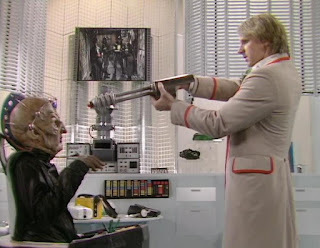 The one scene between the Doctor and Davros highlights Saward's flaws in his approach in making the hero weak just because he didn't want to kill anyone. The characters that Saward seemed to prefer were Lenska's unrelenting bitchy and horrible prison doctor and the antiheroic Lytton, a mercenary and killer with no redeeming qualities. Saward even brought him back for Attack of the Cybermen, a year later. After agonizing over whether he should kill him, the Doctor backs down, Davros tells him that killing someone requires courage, something that the Doctor doesn't have. He then locks the Doctor out of his room, thus winning the argument. It is a really sad attempt to recreate the scene between the Fourth Doctor and Davros in Genesis of the Daleks, over whether he has the right to commit genocide against the Daleks if it would prevent their waging of war. Saward fails to realise that the Doctors not doing so is decency, not weakness, because only crazy people like Davros have no problem with killing others.